Fellow Irish Parenting Blogger and a great food blogger Bumbles of Rice has been revealing all! No, not in that way but her real life dinners. 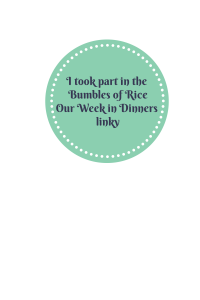 This week she invited others to do the same and I am delighted to join in the Bumbles of Rice Our Week in Dinners linky. We arrived back from a few days in Dungarvan and having gorged on full Irish Breakfast, chocolate eggs and restaurant food we were craving a nice home cooked meal. 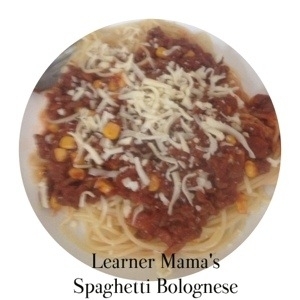 One of the firm favourites in our house is spaghetti Bolognese. It is one meal that I can be guaranteed of clear plates. We call it spaghetti Bolognese but sometimes I mix it up and use tagliatelle or if I am feeling really wild I will try Fusilli! A regular in my shopping trolley is a Whole Chicken. I generally get two dinners out of it (well almost). I tend to Roast it on a Monday or Tuesday (in this case Tuesday). To accompany it I do cous cous and roasted vegetables topped off with gravy. My kids lash a load of tomato sauce over theirs. With a bit of meat left on the chicken the day after our roast always involves a pasta dish with leftovers. As there is never enough meat left for everyone I bulk it up with bacon or prawns (sometimes both) and vegetables (mushrooms, peppers and sweetcorn) and serve it with a creamy garlic sauce. The packet of mince that goes in our trolley is always split in two and put in the freezer. I always have a spare mince lurking in there. As I hadn’t done a proper shop with being away I dug out a mince from the freezer and because we had already done the spaghetti Bolognese thing I made meatballs. I served them with a passata based sauce on a bed of rice. Friday tends to be a slightly junky day. I do my shop on a Friday so you would think it would be our healthiest day but I think as it’s the end of the week and the start of the weekend things slip on the good food front. Myself and hubby discussed having pizza. If we are having “good” pizza it will be a homemade base with toppings such as peppers, sweetcorn, ham or chorizo etc. If it’s a slightly lazy version I will buy a pizza base in the supermarket and add our toppings at home but last Friday our oldest suggested that as it was the end of the holidays we get “Pizza man” pizza. So a quick phone call to our local Four Star Pizza and 30 mins later we had a mega deal! 14-inch pizza, chicken dippers, wedges and garlic pizza bread to be washed down with a bottle of coke. Junk city! Saturday is usually a day that my husband cooks. He loves cooking and more often than not throws my menu plan out the window and creates something wonderful and homely and tasty and we have a lovely family meal washed down with wine and chill out to Britain’s Got Talent (or whatever Saturday night staple is on). Of course I am doing this linky the week all that went out the window. My oldest went off to the zoo for a birthday and we headed off to IKEA. As well as nearly losing our youngest child we had the famous IKEA meatballs and chips with gravy. They are more than likely the world’s most processed meat balls. They were involved in the horse meat scandal but my god they are tasty. Of course eating them at lunch time meant that dinner became tea. The kids had spaghetti hoops or something out of a tin and we had a hot dog each. Sunday was a beautiful day. The sun was shining and it was the last day of the holidays. The fridge was full of lovely meat I had bought on Friday and between Takeaway Pizza and IKEA meatballs none of it had been used (when in reality two portions should have been gone). Hubby is mad for the BBQ and if the sun shines he gets itchy to cook on it. So Sunday it was Mini chicken fillet skewers (having been marinated in a lemon grass sauce), sausages, chicken wings and homemade burgers. A meat feast! Served with cous cous and a green salad and washed down with Prosecco! Bye Bye Easter holidays. Normality is returning this week but the staples of Spaghetti Bolognese and Roast chicken are on the menu this week again! 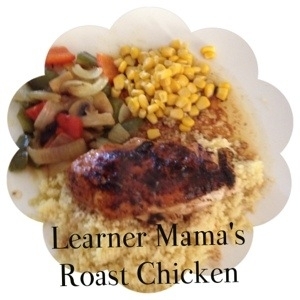 We do tend to fall into a rut of similar dinners each week for a few weeks and then something new will arrive on the horizon and mix it up a bit again. I look forward to seeing everyone else’s meals and getting some more inspiration and inject some new tastes for the summer. Thanks for hosting! Not my healthiest week but the truth must be told 😉 just glad we didn’t have to outline the accompanying beverages! Looks delicious Lucy, my shopping trolley usually contains the chicken for two meals and the mince for two meals, “great minds” and all that! I love your roast chicken dish… feeling very hungry now! Great list.Wishing we had done a BBQ while the weather was good last week, who knows when we’ll get a chance again!! Thanks Aedin! Sure as long as its not raining a BBQ is always an option from April to October in our house! Go for it!